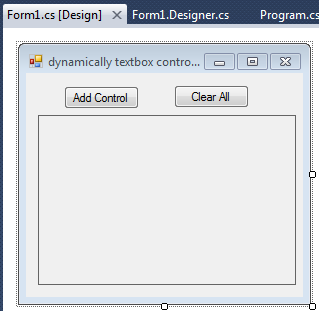 This article will show you how you can dynamically textbox control in a panel and clear all the controls on a single click using c#.net in windows application. 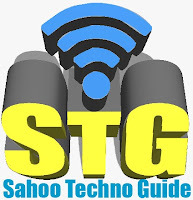 Some of my previous articles are as follows: Confirmation Message on Button Click and Capture YES/NO Click by User in Windows application, C#, Error Handling in Windows Application Using C#.Net, Restrict User to Enter Only Negative, Non-Negative and Decimal Number in TextBox Using C#.Net in Windows Application, Dynamically Add textbox control on button click in windows application using C#.net and VB.net, Paging in DataGridview Using C#.Net In Windows Application, Show Progressbar While Moving Folder File From One Directory To Other Using C#.Net In Windows Application. So for this article first we will create a new windows application and add a panel and button control. Now add the code into the form. In above code we have dynamically added the textbox control and on clear button I have added code for clearing all the controls.